A touching story about the value of friendship, and how sometimes it can be difficult to find just the perfect friend for you . 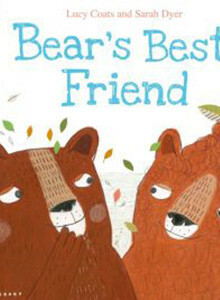 I was introduced to Bear by Sarah Dyer, the lovely illustrator of this book, who had come up with a splendid character, but needed a story for a bear with an unusual hobby. I’m a passionate gardener who loves clipping my hedges into strange shapes, so I connected with Bear and his snipping shears immediately. What I focussed in on at once was that Bear’s topiary habit made him a bit unusual – and unusual can be a problem for a child when it comes to making friends, as I found out myself when I was young. I sometimes felt like the outsider looking in on all the ‘normal’ kids, and although that didn’t stop me being me, it was occasionally hard to deal with. When I was writing the story, I wanted Bear to find his perfect soulmate – and of course, he does – a Bear with hair…twirly, swirly, curly hair, just right for someone with a pair of snipping shears! “The language is a joy…thoughtful and enjoyable” Armadillo Magazine.